What do we know about John Wohlleber? Picture must have been around 1892. John, Emma, Will and Fred. George was born in 1894. 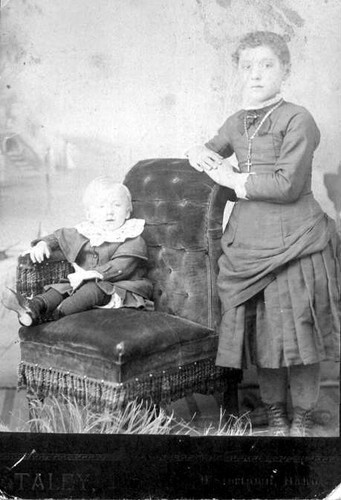 They also had twins born in 1898, Ernest and a baby girl- Ernest died in 1899. Mom does not recognize this picture and she lived in the house in Mazepa for a while. We are assuming this was the house near Medicine Lake in Fuller Township, Codington County. It was given to Evelyn Puhlman by George Wohlleber. Elizabeth Zimmer, Eva Wohlleber and Augusta Beyer. 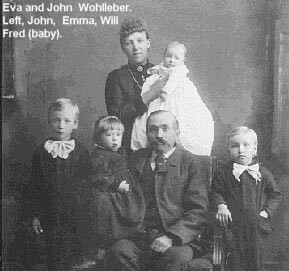 John Wohlleber, Pioneer Settler, First Came to Watertown as Tailor in 1885. John Wohlleber was born on February 26th, 1852 in the vicinity of Bamburg, Bavaria. There he grew to manhood, immigrating to this county when 30 years of age. His first years in America were spent in the eastern states. Later he came west and went to Mitchell, SD in 1884. There he married Eva Barr. The following year the family moved to Watertown where Mr. Wohlleber was engaged in the tailoring business. After 7 years residence here, they moved to a farm near the city. Later they removed to their farm near South Shore in Mazeppa Township, where they lived until they returned to take residence in Watertown in October of the last year. There was a family of 6 children, five sons, one of whom died in infancy. They are John of Mazeppa Township, William W. of Tripp County, Fred of Iowa, and George who made his home with his parents and one daughter, Mrs. Frank Alexander of Iowa. Mr. Wohlleber was a member of the German Lutheran Church in Mazeppa Township. For the last few years he had suffered with a tumor for which he sought relief at the hospital in Rochester. The operation seemed to be successful but the patient evidently did not have sufficient strength to rally. He died last Thursday am at 8:30, lacking about a month of being 68 years old. 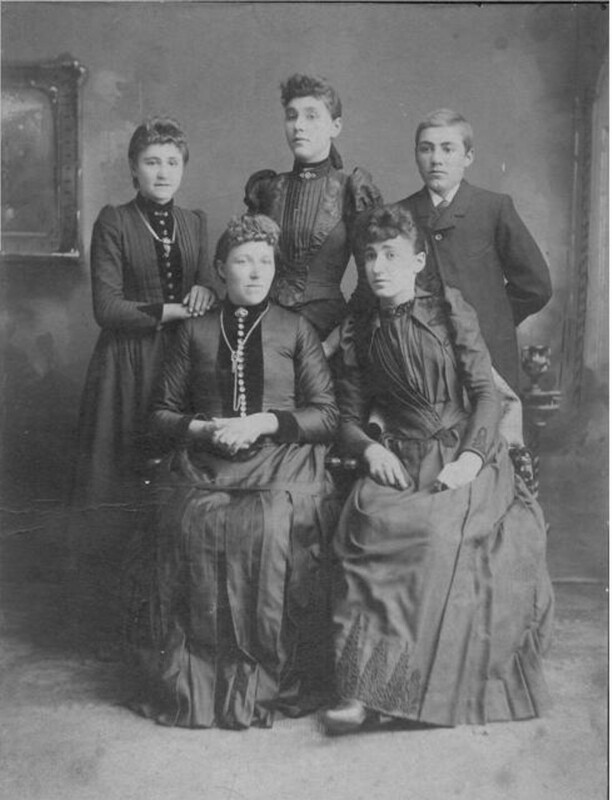 Mourning his death are his widow, Mrs. Eva Wohlleber, the children and the following stepchildren: Mrs. Alva Kiley, Gust Barr, Mrs. Bertha Carlton and Mrs. Mary Lockie. The funeral was held Sunday at the German Lutheran Church. John B. Wohlleber, settler in South Shore vicinity in 1881 dies at 68. Pioneer John B. Wohlleber, a pioneer farmer of Codington County died at Rochester, Minnesota, where he was taken for medical treatment one week ago. The body arrived here this morning for funeral services at the Wohlleber home in Watertown. Mr. Wohlleber was 68 years old. He has made his home on a farm near South Shore since 1881 when he moved here with some of the earliest settlers. He was born in Germany, and leaves a brother and a sister there from whom he had not heard since the outbreak of the World War. Their fate remains uncertain. He has lived in Watertown since October. 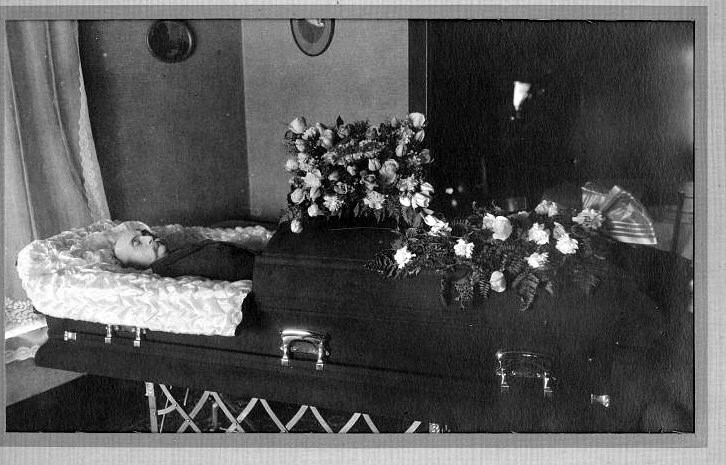 Mr. Wohlleber is survived by his wife and four children, John of South Shore, William of Tripp County, Mrs. Frank Alexander and Fred residing in Iowa, and George, who lived with his parents here. Four step-children left, Ernest Gus Barr, Mrs. J.E. 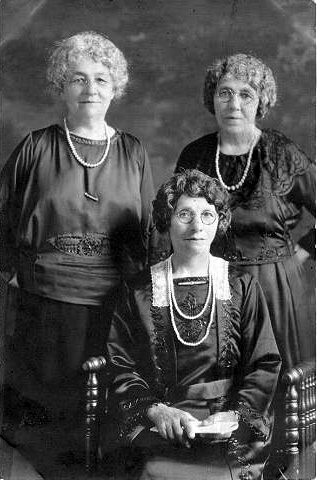 Kiley, Mrs. George Carlton and Mrs ND Locke. Word from relatives out of the city is being awaited before announcement of the funeral service is made but it is probably the service will take place Sunday pm. Watertown Public Opinion Oct 26th, 1938. Mrs. Eva Wohlleber, 84, Ritz Apartments, a resident of Codington County since 1884, died early Monday evening after an illness of two years. Mrs. Wohlleber was born Oct 7th, 1854 in Strasburg, Germany and came to America in 1884, following her marriage to Ernest Barr in Germany in 1872. Mr. Barr died later and Mrs. Barr married John Wohlleber in 1884. 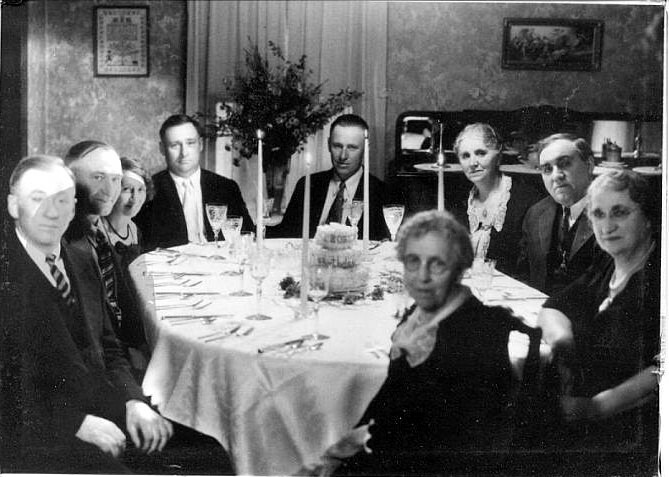 Mrs. JE Kiley of Hollywood, Ca., Mrs. Bertha Carlton of Watertown, Mrs. ND Lockie of Sioux Falls, SD, Mrs. Frank Alexander of Exira, Iowa and five sons, Gus Barr of Grover, John Wohlleber and George Wohlleber of South Shore, Fred Wohlleber of Exira, Iowa and William Wohlleber of Winter. She was preceded in death by her husband and four children. Funeral services for Mrs. Eva Wohlleber, 84, a resident of Codington county since 1884, who died Monday evening, were held Thursday afternoon at 2:30 in St Martins’ Church, preceded by a prayer service in the Shaw-Messer chapel. W. T Meier officiated and burial was made at Mt Hope Cemetery. Members of the church choir consisting of Lorraine Clasen, Cora Taecker, Mrs. Roland Landdeck, Hattie Michaels, Mrs. Laverne Draves and Mrs. Charles Mahanke sang the hymn Nearer My God to Thee, For Me to Live is Jesus and Asleep in Jesus. Mrs. EA Schwandt played the accompaniment. Pall Bearers were George Kuhlman, Ernest Mischke, Edgar Rausch, William McBath, Owen Barr and Wayne White. Relatives and friends from out of town who attended the service included Mrs. N.D. Lockie of Sioux Falls, Mrs. Frank Alexander, Mr. and Mrs.Wayne White and Miss Doris Wohlleber, all of Exira, Iowa. Mr. and Mrs. Adolph Beyer and William Beyer of Roscoe and Mr. and Mrs. Alfred Wohlleber of Milbank. Mrs. Eva Wohlleber, the daughter of Ferdinand and Augusta Hymen, was born Oct 7, 1854, in Strassburg, Germany . In 1879 she married to Carl Barr, in Germany and four children were born to this union. Mr Barr died in 1882 and in 1884 she was married to John Wohlleber. Five children were born to this marriage. Ms Wohlleber passes away last Monday evening after an illness of about two year. At the time of her death she had reached the age of 84 years and 17 days. Wohlleber and John Wohlleber of South Shore, Fred Wohlleber of Exira. Iowa and William Wohlleber of Witten, SD. 24 grandchidren and 18 great-grandchildren also survive. Mrs Wohlleber was preceded in death by her parents, her husband and four children.